Will Clarke was an early self-publishing success story. New York editors rejected his first two yarns, so he released the second one, 'Lord Vishnu's Love Handles,' on his own label. It became a cult fave, got picked up by Hollywood and Simon & Schuster in 2005. But feeling mostly self-taught as a novelist, Clarke got his master's in the University of British Columbia's writing program. He's now releasing his thesis as his third goofy, cosmic novel, 'The Neon Palm of Madame Melancon.' It helps that working in marketing has taught Clarke a lot about printing and graphic design. 'Neon Palm' is, once again, self-published. Welcome to the Art&Seek Artist Spotlight. 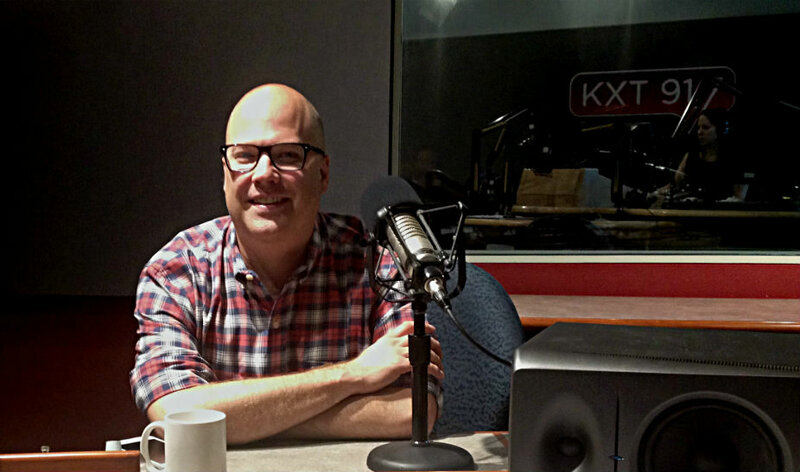 Every Thursday, here and on KERA FM, we’ll explore the personal journey of a different North Texas creative. As it grows, this site, artandseek.org/spotlight, will eventually paint a collective portrait of our artistic community. Check out all the artists we’ve profiled. 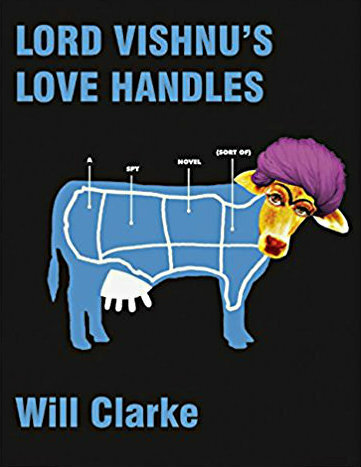 North Texas author Will Clarke writes stories about ordinary people trapped in otherworldly weirdness. His work is absurdist and loaded with pop-culture references. But it’s been 12 years since his last book. So for the latest in our Artist Spotlight series, Art & Seek’s Jerome Weeks caught up with Clarke – just as he’s about to release his newest book. 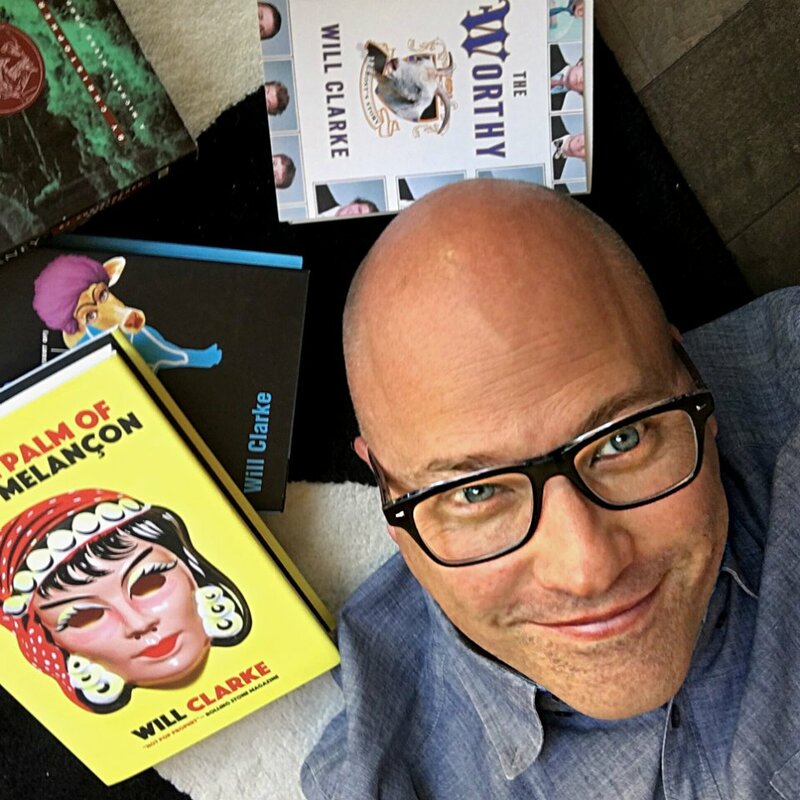 Will Clarke and ‘The Neon Palm of Madame Melancon’ will be at Interabang Books on Aug. 12th and at the Wild Detectives Aug. 17th. Next week, Dallas author Will Clarke will release his third novel – ‘The Neon Palm of Madame Melancon.’ The dark, goofy, cosmic story about an oil disaster and a palm reader who’s mysteriously disappeared takes place in New Orleans. New Orleans makes sense. Clarke’s from Louisiana. So – how’d he get to Dallas? 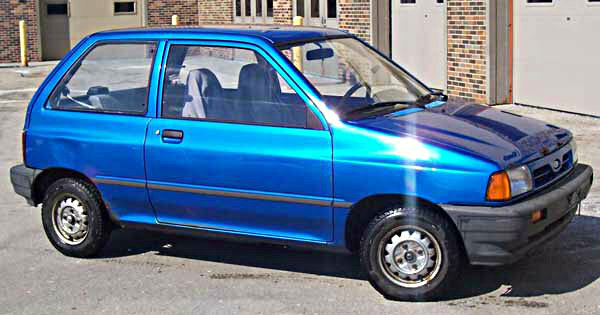 A Ford Festiva. Feel the power and performance. Appreciate the high quality production standards. Note the dent and the rust marks over the rear tire. Dallas was the biggest city his sad little car could make it to. Clarke graduated from LSU in 1991 and came here looking for work. Why here, why not New Orleans? “I love New Orleans,” he says, “but New Orleans is for play.” Not surprisingly, he says, “Dallas is for work.” And work is what he found. It’s significant that Clarke had a business degree, and here he was writing scripts – already. Because writing was something Clarke knew he wanted to do – at seven. Nope. They don’t. But – remember the publishing company. It’ll come back. So in the ‘90s, Clarke was rising through Dallas advertising ranks, freelancing and working for agencies like Tracy Locke and DDB. And on the side, he wrote a novel called ‘The Worthy.’ It’s a dark, goofy, cosmic ghost story about a dead frat boy haunting a fraternity house. Remember that publishing company? 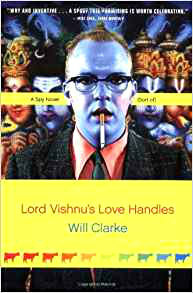 Well, faced with these frustrations, Clarke released his second novel, called ‘Lord Vishnu’s Love Handles,’ in paperback through his own publishing company. Which he called Middlefinger Press. Clarke soon had an agent and a manager in LA. He’d hopped on that happy treadmill, developing projects and drafting TV treatments. All this time, Clarke had been working in marketing and advertising. Nowadays, he’s the vice-president of marketing at Poo-Pourri. Yes, that Poo-Pourri, the toilet scent product that’s also a sponsor of KERA. You may also know the company from its very first YouTube video with the classy-looking young woman using salty language – that video alone has gained more than 39 million views. There have been a half-dozen follow-ups, some of them garnering 10 million, 12 million views. It just so happens the narrator in Clarke’s new novel, ‘The Neon Palm of Madame Melancon,’ is a lawyer in public relations. 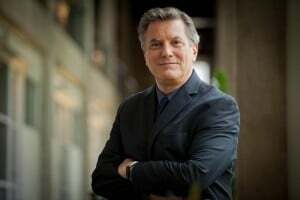 He’s tasked with helping an oil company put on a good face and fabricate a convincing story – after the oil company unleashed a Deepwater Horizon-level disaster all over the Gulf. Clarke can’t help noting the similarity between writing novels and the whole public relations and marketing business: They’re both about shaping narratives. “At their very, very core,” he says, “narratives are the operating system of the brain. And if you can control the narrative, you can control people’s brains,” he laughs. So what mysterious marketing art has Clarke employed to control our brains so we’ll buy ‘The Neon Palm’? Well, back in May, he released a Kindle version of the novel on Amazon – and charged $10,000 for it. He did it, frankly, for the attention. Whether readers will buy ‘The Neon Palm’ will probably depend on whether they enjoy its dark, goofy, cosmic story about an endangered New Orleans and all the Big Easy’s funky, spooky ways. What sets the book apart in Clarke’s work is his real fear for our environment. Clarke’s idol has always been Kurt Vonnegut, especially for his absurdist humor. He’s read everything Vonnegut’s written, researched his life and he learned that “near the end of his life, Vonnegut was really disgusted that we were these fossil-fuel addicts.” Almost every major technology or industry humans have developed is dependent in some way on extracting oil from the ground (even the plastics used to build solar panels — or, as Clarke points out, the kayaks Greenpeace paddles to surround freighters). So it shouldn’t be a big surprise that the author of ‘Slaughterhouse-5’ himself appears in ‘The Neon Palm’ It’s an homage – and something of a Vonnegut-sy move on Clarke’s part to include his hero as sort of a mysterious, guiding spirit. Or maybe the character is just a mentally addled homeless guy. Or a figment of the narrator’s frenzied imagination. What can I say? It’s a Will Clarke novel. When did you consider yourself a novelist? Not just, you know, I liked telling stories as a kid, but when did you realize you had to write, had to get published? So it’s always been a big part of my identity. That sounds a little corny to say that at seven years old, I knew that. But I thought everybody had something like that. The first time I really considered myself a novelist was really at SMU. I was in this writing class there that Barbara Wedgewood taught. [Wedgwood was a true-crime writer and playwright who died in 2015 at 85.] When I saw Barbara that’s when I realized you could actually do that as a vocation. She was the first person I met who did that for a living. And I realized that’s what I wanted to be. And then, when I completed ‘The Worthy’ [his first novel, although it was published after ‘Lord Vishnu’s Love Handles’], I felt like a novelist. Writing and publication are two different things. If you’ve completed a novel, you’re a novelist. What have you given up to pursue your writing career? You obviously haven’t given up your job in marketing. David Sedaris talked about this in one of his Arts & Letters Live talks. He said basically, there are four burners in your life, right? It’s family, friends, health and career. And in order to get one of those burners really hot, you gotta turn off one of the others, maybe two of them. So I would say I definitely don’t see my friends nearly as much when I’m writing. But my brain just doesn’t work socially at all when I’m writing. I’m kind of dreamy and not present. And that can go for years at a stretch. And then my health, to some degree. I don’t exercise as much as I should. So I should really try to stay on top of that. But family and career are the two things I probably focus on the most. How has living in North Texas affected your art? It’s been really great for me. Dallas – it’s a city that’s deceptively friendly to artists. I don’t think people think of it that way. But there’s a really great literary community developing that I found, that I’ve been able to build with friends over the years, and that’s been great. I still meet with the same writers group from SMU that we first met 20 years ago. We still meet every Wednesday to critique work. Originally, there were seven of us, and four of us have been published by major publishers. It’s a great group of people, it’s been a great support. And I think that’s one of the things that’s important. I learned this when I was at Breadloaf, the writer’s conference up in Vermont. Robert Frost started it mainly because writer’s need community. Writing’s a very solitary activity and as you turn off the burners to make the other burners burn hotter, your friendship burners get turned down. You don’t make as many friends. It’s also a very strange hobby. If you were not writing, you’d be considered mentally ill. You live in an imaginary world, you have a lot of imaginary friends, you talk to yourself a lot. And other writers understand that, they get that. It’s interesting. My writers’ group – we’re from all these different walks of life. You’ve got these hard-core Republicans who live in Highland Park, you’ve got these really liberal people from Oak Cliff. It’s a really interesting mix of people. And the one thing we have all in common is writing. Do you have any writing rituals? Anything you do to get going with a blank page in front of you? There needs to be coffee, that’s pretty much a given. Iced coffee because it gets into your bloodstream the fastest. And I like to stand up when I write, so Starbucks now has these really great standing tables. I like that a lot. I like to have a certain amount of background noise for me to push against mentally. At certain stages of the writing process, I actually like being in a noisy place. I wrote a lot of this book while at Wild Detectives. There’s a vibe to the place that’s really good. They also have a lot of books; it’s like a library. You get stuck, you can go exploring books. And I do like to listen to music at certain points. So depending on which stage of the book I’m at, there’s different things I like to do whether that’s music or being at home. And I do like waking up super-early. Four o’clock in the morning is a really great time to wake up. Your mind is really close to the subconscious at that point, you’re too bleary to make yourself not want to write. I can get a lot done between four and six. My Saturday and Sunday typically consist of me waking up at four, piddling around the house, then the Starbucks opens up at 5, so I go there at 5, and standing there, I get about four hours of writing done on the weekends.